* The Obama Administration continues to insist that it would like to see a diplomatic solution to the civil war in Syria. But this desire flies in the face of everything we’ve learned about how civil wars have ended over the last 70+ years. In the first item (below) are four things that President Obama should understand about how civil wars end. * An imam in a rebel-held district of Damascus issues a fatwa allowing residents to eat cats and dogs, in a desperate bid to ward off starvation after months of being denied food supplies by the Assad regime. Tens of thousands of civilians remain trapped in these areas, as Assad refuses to allow food in, they have been forced in recent weeks to survive on stray dogs, rotting animal carcasses, tree leaves and weeds. * The chronic malnutrition has already resulted in the deaths of a number of babies: Mothers are so malnourished that they cannot produce any milk. * German companies supplied Syria’s regime with material that could be used for chemical weapons, as late as 2011. The export included 270 tons of sodium fluoride, hydrofluoric acid and ammonium hydrogen fluoride used in creating sarin gas. Whither Saudi Arabia? (& Refusing to join a UN that abets mass murder). * Video dispatch 18: Syrian refugees: “May God bless Israel” . * Israel’s secret doctors (& Disabled Gaza toddler lives at Israeli hospital). The Obama Administration continues to insist that it would like to see a diplomatic solution to the civil war in Syria. But this desire flies in the face of everything we’ve learned about how civil wars have ended over the last 70+ years. Here are four things that President Obama should keep in mind as he considers the feasibility of pushing for a negotiated settlement in Syria. Civil wars don’t end quickly. The average length of civil wars since 1945 have been about 10 years. This suggests that the civil war in Syria is in its early stages, and not in the later stages that tend to encourage combatants to negotiate a settlement. The greater the number of factions, the longer a civil war tends to last. Syria’s civil war is being fought between the Assad government and at least 13 major rebel groups whose alliances are relatively fluid. This suggests that Syria’s civil war is likely to last longer than the average civil war. Most civil wars end in decisive military victories, not negotiated settlements. Of these wars governments have won about 40% of the time, rebels about 35% of the time. The remainder tend to end in negotiated settlements. This suggests that the civil war in Syria will not end in a negotiated settlement but will rather end on the battlefield. Finally, the civil wars that end in successfully negotiated settlements tend to have two things in common. First, they tend to divide political power amongst the combatants based on their position on the battlefield. This means that any negotiated settlement in Syria will need to include both the Assad regime and the Islamists, neither of whom is particularly interested in working with the other. Second, successful settlements all enjoy the help of a third party willing to ensure the safety of combatants as they demobilize. This means that even if all sides eventually agree to negotiate (i.e., due to a military stalemate or increasingly heavy costs), it’s unlikely that any country or the U.N. will be willing to send the peacekeepers necessary to help implement the peace. The likelihood of a successful negotiated settlement in Syria? Probably close to zero. Syrian snipers targeted pregnant women on more than one occasion, a British surgeon said Saturday after returning from a five-week stint in the conflict zone. According to an interview with The Times newspaper David Nott, who spent five weeks volunteering at a Syrian hospital, said he treated more than half a dozen shot pregnant women on one day in a Syrian city. He did not identify the city for security reasons but said that he regularly treated gunshot wounds that indicated that bored snipers were targeting particular parts of civilians’ bodies in a bid to entertain themselves, reported Agence France-Presse. “One day it would be shots to the groin. The next, it would only be the left chest,” he told the newspaper. On one day, two consecutive gunshot patients were heavily pregnant women, both of whom lost their babies. “The women were all shot through the uterus, so that must have been where they were aiming for,” he told The Times. Nott is a prominent surgeon in the UK who counts former Prime Minister Tony Blair as an ex-patient and has volunteered as an emergency surgeon in warzones for 20 years. He usually works as a vascular surgeon at London’s Westminster and Chelsea hospital but has served in warzones in countries including Bosnia, Libya and the Democratic Republic of Congo. IS THIS THE MOST SICKENING IMAGE OF THE WAR IN SYRIA SO FAR? Dr David Nott witnessed evidence of fighters using civilians as target practice and on several occasions shooting pregnant women in the stomach, killing their unborn babies. 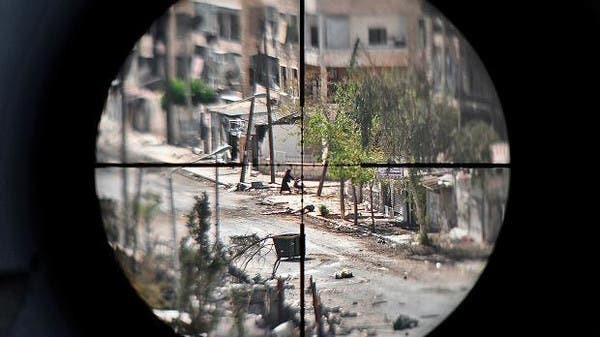 Dr Nott, recently returned from volunteering at a Syrian hospital, said there are local rumours the snipers are sell swords, working for the Assad regime, awarded when they ‘hit the correct targets’. Dr Nott, a vascular surgeon at Chelsea and Westminster hospital in London, has told of the horrors suffered by civilians caught between government troops and rebels, describing it as ‘hell beyond hell’. ‘From the first patients that came in in the morning, you could almost tell what you would see for the rest of the day. It was a game,’ he told The Times. Dr Nott, who counts Tony Blair among his former patients, has returned to London after five weeks in Syria to reveal abysmal conditions in the local hospitals with little to no evidence of aid. The civil war in Syria show no evidence of slowing down today as government air force jets bombarded the eastern city of Deir al-Zor on Friday. Heavy overnight clashes saw the killing of dozens of rebels and pro-Assad forces, including one of the president’s top military intelligence officers, activists said. General Jama’a Jama’a was shot dead on Thursday by snipers in the midst of a battle with rebels including forces linked to al Qaeda, the Syrian Observatory for Human Rights said. His death, celebrated by rebels and opposition activists, marked a significant setback for Assad’s bid to retain a hold over the city, capital of the eastern oil-producing province. Syria’s civil war has killed more than 100,000 people and divided the Middle East between Sunni Gulf states and Turkey which mostly support the rebels, and Shi’ite Iran and Hezbollah which have backed Assad. International efforts are growing to convene peace talks in Geneva next month, encouraged by rare agreement among global powers over the elimination of Syria’s chemical weapons after sarin gas attacks near Damascus in August. But the United States and Russia, responding to Syria’s announcement that the talks would go ahead in Geneva on Nov. 23-24, said on Thursday that no date had yet been set. The international envoy for Syria, Lakhdar Brahimi, is due to hold talks in the Middle East next week to try to prepare for the negotiations, his spokeswoman said. An imam in a rebel-held district of Damascus has issued a fatwa allowing residents to eat cats and dogs, in a desperate bid to ward off starvation after months under siege by the Assad regime. Salah al-Khatib, the cleric who issued the edict, said he had been left with no choice but to lift the usual restrictions under Islamic law, after government forces and pro-regime militias choked off food and medical supplies to three rebel-held suburbs of Damascus and to a camp housing Palestinian refugees. This is “not because it is religiously permitted, but because it is a reflection of the reality we are suffering”, Mr Khatib told AFP on Tuesday. Tens of thousands of civilians remain trapped in these areas, some of them living under siege for more than a year. Residents have told The Telegraph that as food has run out, they have been forced in recent weeks to survive on stray dogs, rotting animal carcasses, tree leaves and weeds. Shops in the camps were “completely bare” and the tight siege was preventing any movement in or out of the camp, Ehab said. The only proper food remaining was small quantities of rice. As he spoke, Syrian state television was broadcasting footage of President Bashar al-Assad, dressed in a sharp suit, attending prayers to mark the Muslim Eid al-Adha feast in a mosque just a few miles away. Meanwhile Asma al-Assad Syria’s first lady, was shown on state television planting olive trees with children. Their appearance during the festival of Eid al-Adha, when Muslims would normally visit relatives and friends and celebrate with bountiful food, was in stark contrast with the starving rebel areas, where some residents interviewed by The Telegraph broke down and begged for help. Over the last 10 months Syrian government troops have been steadily reducing the amount of supplies allowed into these areas. Mohammed and Alaa, two residents of Yarmouk, told The Telegraph that initially women and elderly men had been allowed out of the camp to shop for supplies. The situation is causing chronic malnutrition that residents say has already resulted in the deaths of a number of babies, a claim that cannot be independently verified. “Mothers are so malnourished that they cannot produce any milk, and there is almost no baby formula left,” said Omar speaking from the southern suburb of Darayya. For some, relief came earlier this week when the International Committee of the Red Cross and the Syrian Red Crescent evacuated an estimated 3,500 people from Moadimayet al-Sham, with the agreement of the authorities. But only children, women and old men were able to leave, with the wounded left behind and aid workers prevented from entering to assist them. “There are many more, including children, who remain in the town,” said Magne Barth, head of the ICRC delegation in Syria. Tom Gross adds: According to reliable sources, a major battle is brewing up in the Qalamoun mountains with the regime and Hizbullah about to launch an offensive against rebel-held areas in the coming days. Many believe this fighting will spill into Lebanon. A week before Chancellor Angela Merkel’s September 22 election victory, a Left Party deputy revealed that German companies, under successive coalition governments between 1998 and 2006, supplied Syria with chemicals. According to the new ARD report, German companies delivered roughly 350 tons of dual-use chemicals to Syrian President Bashar Assad’s regime between 1998 and 2011. The previous known total of German sold chemicals to Syria was 135 tons between 2002 and 2006. The exports included 270 tons of fluoride, which is key in the manufacture of sarin. 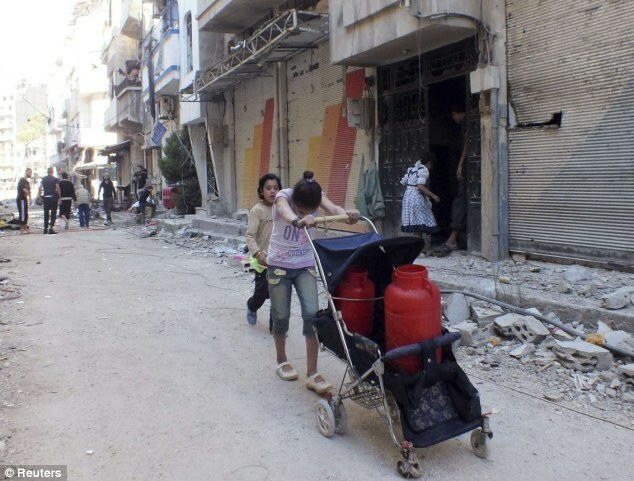 Under the European Union’s legal framework, the chemicals sold to Syria were designated as dual-use goods. Germany’s export agency BAFA has a liberal permit policy and has been criticized over the years for failing to clamp down on dual-use goods sold to Iran. The German government said two weeks ago that there was no data bank or control mechanisms available to check on a regular basis the end use of the dual-use deliveries. Meanwhile, Israel’s ambassador to Bulgaria, Shaul Kamisa-Raz, urged the EU to help Bulgaria absorb the flow of Syrian refugees into the southeastern European country, the Sofia news agency and the BGNES news agency reported on Saturday. “Some of the refugees may integrate in the Bulgarian society, but this will be a very difficult task for the government,” Kamisa-Raz said.